This feature is from awhile back, but given Laday Gaga's recently engagement to Taylor Kinney, we thought we would bring it back again. We are guessing that her wedding will be a bit more traditional, and not what we would expect from the pop-star, but in true Lady Gaga fashion we will all be surprised. Who knows, maybe she will see this features and incorporate a few of the art pop details designed by Zoie Events and Bunch Studio. You can see all of the photos from this Lady Gaga inspired wedding here. 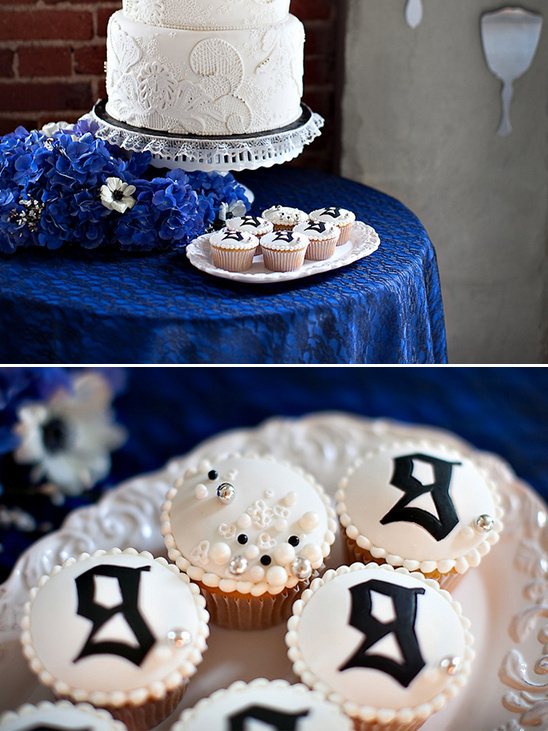 Every last detail captured by Ashleigh Taylor Photography. Infusing both funky and feathery, the bride’s bouquet was created with protea and mini callas. 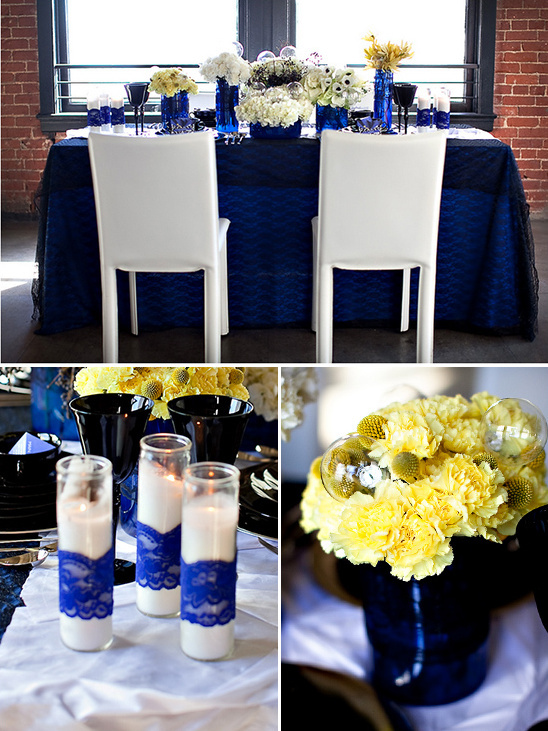 Our tablescape utilized many textures from the black lace draped over blue linens to our white leather chairs with a folded origami style blue napkin. 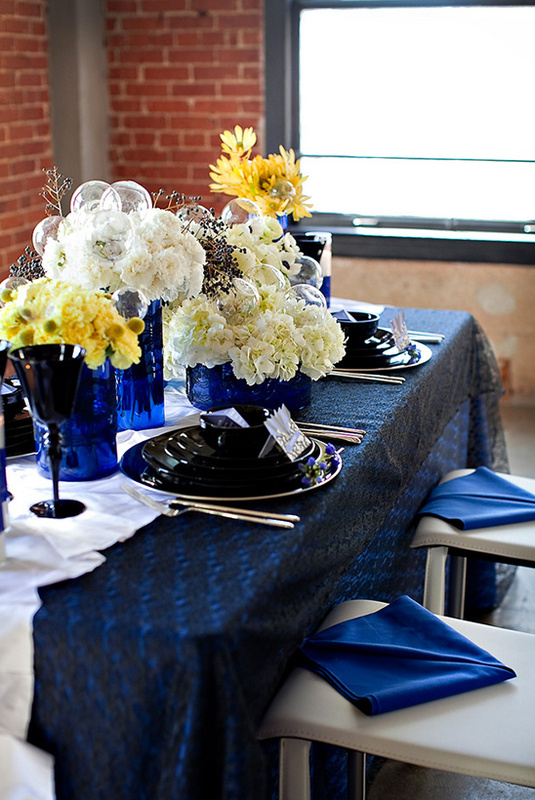 Modern electric blue glass vases adorned with a feminine black lace band, black china, sleek utensils, and a white origami fabric runner helped to create the unique tablescape. Unconventional arrangements of anemones, kale, hydrangea, carnations, safari, veronica, privet berries and crespedia were accented with carnations to provide a ruffled layered texture and glass bubbles to provide for an out-of-this world vibe. The modern white-laced 3 tiered cake adorned with Gaga’s white lace feathered cap was the centerpiece and surrounded by a mix of bitter, sweet, sour, black, white and yellow colored desserts. The fun delights included oreos, marshmallows, meringues, mini coconut cupcakes, mini blueberry cupcakes, cupcakes, sliced lemons, lemon drops and black licorice pinwheels. The confections were served in glass and porcelain lace bowls and decorated with dessert tags utilizing Lady Gaga’s song titles that describe the emotion one feels from enjoying the delightful desserts. When we heard news about Lady Gaga’s newest single being released on February 13, 2011, our hearts skipped two beats with excitement. Then we heard her describe her album Born This Way as a marriage of electronic music with major metal or rock n roll, pop, anthemic style melodies with really sledge-hammering dance beats and we KNEW that we wanted to create a Gaga wedding marrying her performance art, music and fashion styles. Known for her eccentricities and outrageous sense of style in music and fashion, we found great excitement in challenging ourselves to push the wedding boundaries and create a Lady Gaga inspired wedding. In creating our feminine yet bold, eccentric and dramatic wedding, we drew inspiration from Lady Gaga’s fashions, music videos, and album covers, more specifically, her dress made of strategically placed bubbles, her origami crystal Thierry Mugler dress, art direction and colors from her Telephone music video, Just Dance and The Remix album covers. Incorporating a mix of unconventional bold colors, patterns and textures set the tone for our avant garde inspired wedding shoot. We believe that your favorite artist can unlock a whole world of inspiration, unravel the lyrics, textures, colors and have fun marrying Gaga style! Infused into the wedding elements were embellishments of lace, feathers, origami and bubbles for a funky and fun feel. 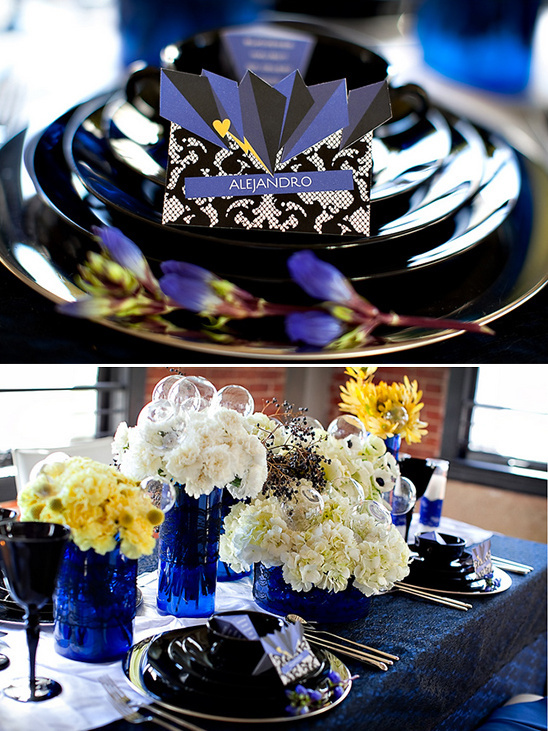 We utilized the following colors: black and white accented with the primary colors of “electric kiss” blue and taxi cab yellow. 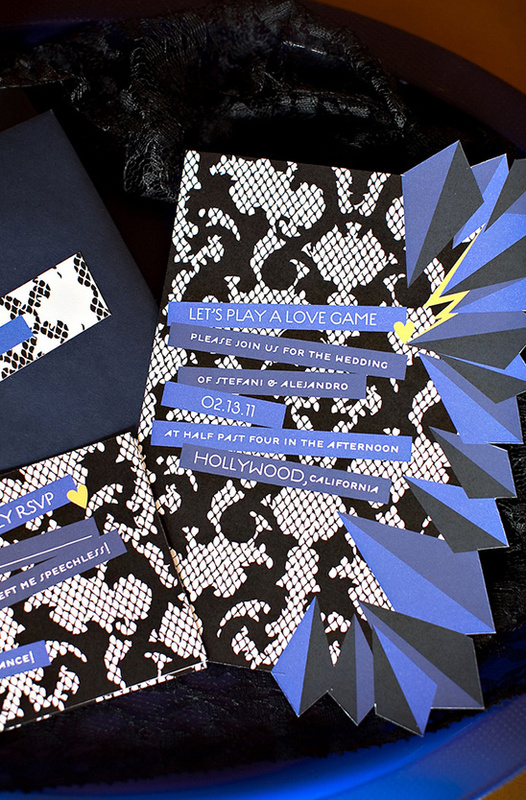 As a prelude to the anticipated fun and eclectic, guests are invited to the wedding with a rockin’ stationery suite that pulled together an ensemble of visually fun textures, patterns of lace and fishnet offset by origami shapes and geometric diamonds. Inspired by Lady Gaga’s origami crystal Thierry Mugler dress, geometric diamonds and lace pattern accent the suite and serve as unifying motifs incorporated throughout the each piece. The text and lightning bolt treatment on the invitation plays on Lady Gaga’s eye make-up. Guests are welcomed to the table with pop-out place cards and enticed to the evening’s fare with a three-dimensional menu diamond. 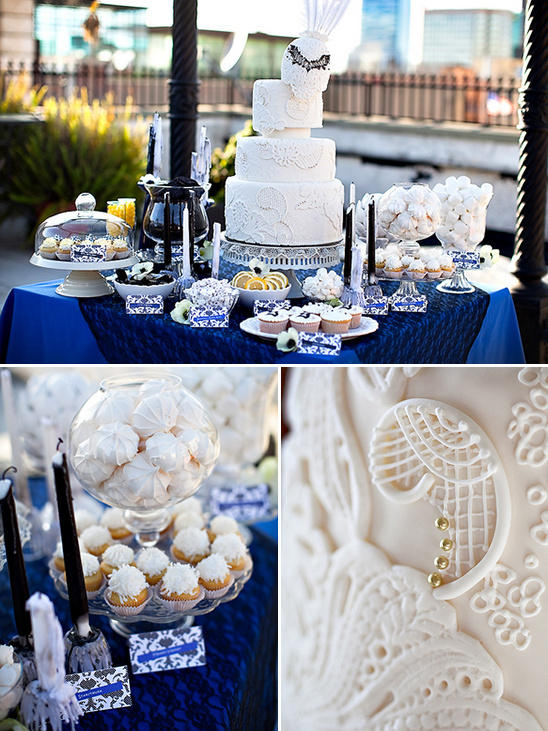 The cake and dessert bar was set under a black wrought-iron gazebo in the open beauty of the downtown Los Angeles skyline. 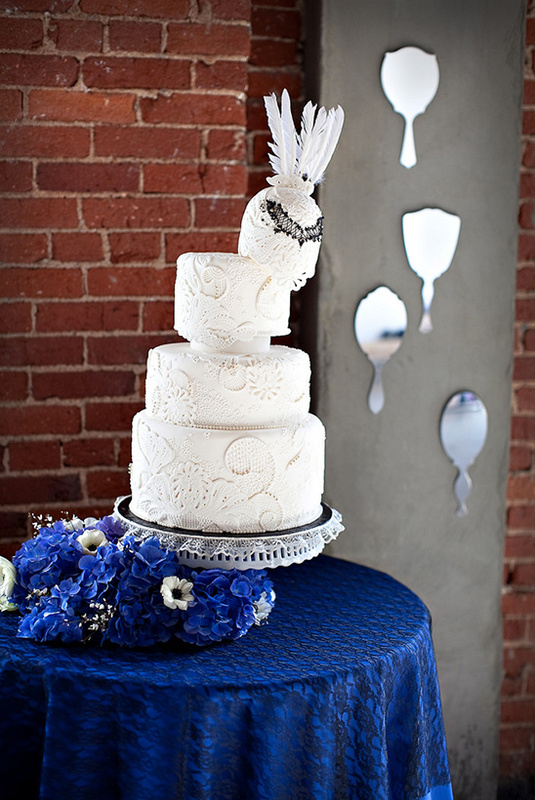 The modern white-laced 3 tiered cake adorned with Gaga’s white lace feathered cap was the centerpiece and surrounded by a mix of bitter, sweet, sour, black, white and yellow colored desserts. The fun delights included oreos, marshmallows, meringues, mini coconut cupcakes, mini blueberry cupcakes, cupcakes, sliced lemons, lemon drops and black licorice pinwheels. The confections were served in glass and porcelain lace bowls and decorated with dessert tags utilizing Lady Gaga’s song titles that describe the emotion one feels from enjoying the delightful desserts. Drawing from inspirations of origami edges, textures and Lady Gaga’s infamous crystal Thierry Mugler dress, our bride, Stefani, made a fearless statement in a structured single-shouldered white and black ceremony dress. The ensemble was finished with her black heart wedding ring, a paparazzi ring, gold bangles, various gold rings and electric blue nail polish and heels. Never the predictable, for the reception, our Gaga bride wore a modern black strapless tulle gown featuring all-over lace ruffles. Her captivating look was completed with black lace gloves, a layered white, black and gold pearl necklace and various gold rings and bangles. As an alternative to the traditional veil, our Lady wore a custom-made black feathered veil. Lady Gaga always mixes it up! Thus, when its time to cut the cake, our bride changed into a handcrafted lace cap with veil, reminiscent of the wedding cake and Lady Gaga’s The Remix album cover. For our modern and edgy grooms, we dressed them in head to toe black suit and shoes. The look was decked with a studs and spikes brass wedding ring and black lace pocket square.